Living can either be indoors or on the covered terrace overlooking the lovely large pool and tropical gardens stretching to 1 1/2 acres. 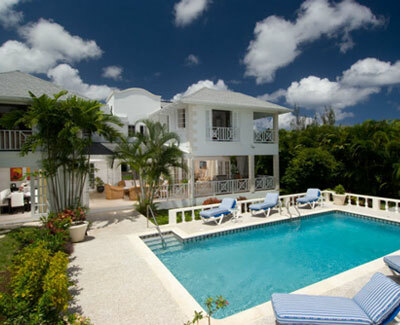 Rose of Sharon is an elegant 5 bdrm villa located in Sandy Lane Estate in pristine condition. There are 3 double air-conditioned bedrooms in the main house on the first floor, with the Master bedroom having its own ensuite bathroom and the other 2 bedrooms sharing a bathroom. The additional 2 bedrooms are located in a recently built guest cottage across from the pool, with their own living and dining areas and fully equipped kitchen. Each bedroom has an ensuite bathroom and is air-conditioned. Living can either be indoors or on the covered terrace overlooking the lovely large pool and tropical gardens stretching to 1 1/2 acres. The ground floor of the main house includes a large air conditioned living room opening onto the covered terrace and a separate dining room and further breakfast/kitchen area. This villa can also be rented a 4 or 3 bedrooms.